Cellulitis is an inflammatory condition affecting the subcutaneous layer of the skin, often involving the lower dermis as well. It is almost always due to an infection. Cellulitis is often confused with erysipelas which is a more superficial infection of the skin, affecting the dermis but also frequently extending to the upper parts of the subcutaneous tissue. It is often difficult to differentiate between cellulitis and erysipelas. The infection is mainly caused by gram positive bacteria, particularly group A streptococci, invading the skin and subcutaneous tissues. Staphylococcus aureus infection is another common cause of cellulitis and treatment may be more aggressive with MRSA (methicillin-resistant Staphylococcus aureus). The onset of cellulitis is often preceded by an injury to the skin but in some cases like following surgery, previous history of cellulitis and leg edema (swelling), there may be not any apparent injury to the skin at the affected site. Dry skin can lead to microabrasions of the skin which may also serve as an entry point to invading microorganisms. Some of the bacteria involved in cellulitis are otherwise harmless strains normally present on the skin, in the mouth or nasal cavity. Others are transferred from the environment, water and inanimate objects (fomites). Cellulitis can affect any part of the body but is more common on the arms and legs. The subcutaneous layer lies under the dermis, which is the deeper layer of the skin. It is a connective tissue layer abundant in fat, nerves and blood vessels. Once the bacteria reaches the affected site, it multiplies and irritates the surrounding tissue as explained under the inflammation process. The action of the immune cells and chemicals (mediators) further propagates the inflammation. The cardinal features of inflammation are present in cellulitis – pain, heat, swelling (edema) and redness of the skin (erythema). 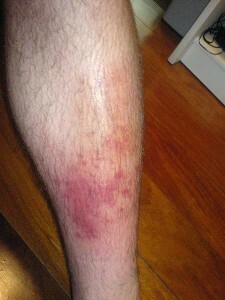 With erysipelas, the erythema is clearly demarcated with raised red borders, while it is flat in cellulitis. Blisters on the skin surface may be apparent and an abscess, which is an accumulation of pus, may develop at the site. Other features that may be noted is swelling around the area, enlarged lymph nodes, fevers and chills. Long red streaks may be present which is due to involvement of the lymphatic system. What starts as a minor break in the skin can progress to a potentially deadly infection known as cellulitis. It is an infection caused by bacteria that involves the skin and underlying tissue but the fact that it is so superficial should not be taken lightly. Cellulitis can rapidly spread, destroying tissue and even leading to the bacteria spreading through your bloodstream to all parts of the body. It is of particular concern in the these days when multi-drug resistance bacteria makes just about any infection difficult to treat. Bacteria are abundant everywhere in our environment and even live on and in the human body. But our body has many defense mechanisms to prevent these bacteria from penetrating our skin. It usally does not pose a problem unless the skin is damaged, unable to heal properly and the immune system cannot confine the bacteria. Antibiotics are very effective in treating bacterial infection but with the rise in multi-drug resistant strains like methicillin-resistant Staphylococcus aureus (MRSA), cellulitis can quickly spiral out of control. Impaired immune defenses like in HIV/AIDS. Severe acute or chronic skin diseases. People with these risk factors need to be extra cautious as they are prone to cellulitis, possibly even repeatedly. A few simple measures can go a long way in reducing this risk. The initial injury that may develop into cellulitis is not always large, open and easily visible. Sometimes the smallest of injuries can progress into cellulitis. Remember that even an insect bite could be responsible for introducing bacteria under the skin. Diabetics in particular do not have the same ability to perceive pain, heat and pressure which can mean that injuries arise and it is not even felt. You should inspect your legs daily if you have known risk factors for cellulitis. Look out for even pinpoint areas of injury. Take note of symptoms like swelling, redness of the skin and tenderness even before you develop symptoms like severe pain and fever. Always speak to your doctor about the correct way of caring for your wound. Without the proper routine, a small wound can lead to cellulitis. Wash the area around the wound if water cannot be applied on the affected area itself. Dry thoroughly. Let it air dry for a short period or use a hair dryer on a low heat setting to ensure that there is no residual water. Apply an antibiotic cream as prescribed by your doctor. It should be applied on the wound and even a short distance around it on normal skin. Cover your wound with the appropriate dressing as recommended by your doctor. Make sure that you use clean dressings. Your feet are often the area most likely to be injured without you even knowing it. This is more of a problem for diabetics who develop a nerve condition known as diabetic neuropathy. Sensation in the feet (pain, touch and temperature) is significantly impaired and a similar problem can arise when you have poor circulation in your legs for a long time. Therefore you may not even realize that you injured your foot especially when it is minor injuries. Rather take the necessary precautions ahead of time. Do not walk barefoot when outside or in any environment you are unfamiliar with where an injury may be possible. Wear correctly fitting footwear at all times to minimize the chances of injury. Most of us do not give the skin and nail care regimen for the legs and feet much thought beyond the aesthetic aspect. But it is very important in cellulitis prevention particularly if you have diabetes or circulatory problems of the leg. Dryness of the skin makes it more prone to breaks with an injury. Moisturize your skin daily especially after bath and using a more oily application if you skin is very dry. Keep your nails short but be careful when clipping as the skin underneath and on the sides of the nail can be easily injured. It may be better to consult with a podiatrist about proper nail care on a regular basis if you are a diabetic or have circulation problems of the leg. Regular exercise can be very helpful for any number of conditions affecting the leg that may increase the risk of cellulitis. Every step you take helps to push blood back to you heart which is useful if you have impaired blood circulation of the legs. It also improves blood flow to the legs and feet which may also aid with wound healing. Exercise is a major component in managing obesity. It also helps with glucose control in diabetics. However, you should not overdo the exercise and you should always wear the correct footwear. Try to avoid exercising if you suspect that you have cellulitis as you could further worsen your condition. Resume exercise once the condition is treated. Last updated on 9 August 2018. Can Piercings Cause Staph Infection?